Almost since the beginning of history, the flag or banner has been a symbol of authority, a symbol of who or what was in control of society. The ancient Egyptians, Assyrians and Jews all had their own flags and used them to rally their forces in war as well as peace. It was usually made of cloth with a distinctive design or symbol, was colorful, and above all symbolic. Here in Newark our first flag was the Union Jack of Britain, since we were a British colony, which incorporated the symbols of England, Scotland, Ireland and Wales, the crosses of St. George, St. Andrew and St. Patrick. This symbol was our standard for nearly a century and a quarter until the Revolution's outbreak. In 1776, Gen. George Washington raised the first American flag with 13 stripes at Cambridge, and the following year the 13 stars were added to create the first modern American flag, one of the world's most recognizable banners. Since that time all American flags with an increasing number of stars have flown over the city from modest flag poles in the front yard to major flag staffs on great public buildings, atop hundred-foot high locations in the parks and from the highest point in the city such as the National Newark Building. In Atkinson's 'History of Newark,' an American flag was flying from the roof of a building at Military Park as General Washington's 3,500 troops were retreating south on Broad Street on November 22, 1776. At the end of the war a steel engraving showed the plight of Newark Loyalists as their property was being seized by patriots. In the background, the American flag flew over the unhappy scene as some of Newark's former leading citizens were being herded into open wagons or hoisted upside down on a flagpole. In 1824, the front door of the Boudinot mansion was decorated with American and French flags for the visit of the Marquis de Lafayette. From 1834-39, the Newark whaling ship John Wells flew a large American flag from its mast. In 1844, Theodore Frelinghuysen ran for vice president with Henry Clay and their images were used as part of a political banner. Frelinghuysen's face was superimposed on a flag where the field of stars would have been, and the names Clay and Frelinghuysen added to one of the white stripes of the flag. One of Newark's best known 19th century woodcuts was a sketch drawn from the southern end of Military Park showing the park's great elms, Trinity Church and the hay scales. But the most prominent feature at that end of the park was the old Liberty Pole, site of today's Military Park flagpole. On May 17, 1866, Newarkers took time out from the exhausting Civil War to celebrate the city's 200th anniversary with laborers, veterans, bandsmen and city officials parading. Of course, the American flag was the most prominent element of the sketch which appeared in Frank Leslie's Illustrated Weekly. In 1872, when Newark held the nation's first industrial exposition, the interior of the hall was lavishly decorated with all types of flags and banners. The place of honor was reserved for Old Glory. Patriotism did not fade with the passage of time. There is a wonderful photograph in the Library of Hahne's department store during World War I Christmas season when the building had a three-story atrium at its center decorated with a 15-foot Santa Claus among dozens of American flags—a happy blend of patriotism and holiday spirit. In the 19th century, a large number of new immigrants of Irish, German and Italian extraction became citizens. Often, they were active in noisy and colorful parades which were held on religious feast days and important American holidays. In the German community, even foreign military success was celebrated. When Port Newark was being created in 1915, the tug boat bore the American flag, as did the new ships being launched at the Port. In 1918, the Agawam slid down the waves at the port flying the American flag. 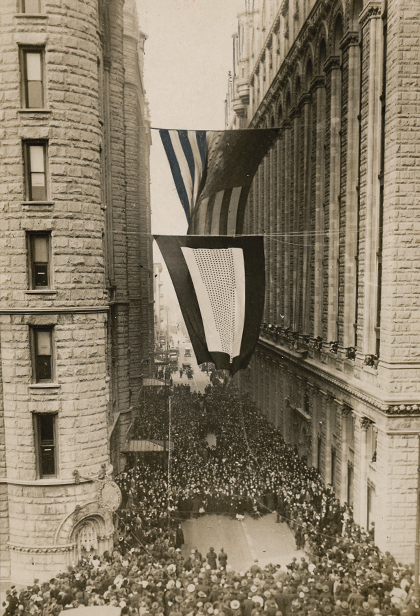 In addition to great demonstrations of patriotism, World War I also produced sights such as twenty women workers marching up Broad Street past city hall carrying a banner nearly the width of that great street bearing the salutation 'The Girls Behind the Men Behind the Guns'—a statement showing their endorsement of the war effort as the women who were helping to run the war effort at home. Small wonder that the nation's largest flag maker, the Annin Co. in Verona, has always had a good customer in Newark. The earliest permanent record of a flag or flagstand in Newark was the Liberty Pole, erected on July 3, 1793, at the southern end of Military Park. A large pole has been located there ever since, making it one of the most prominent sites in town and an important place where the American flag is on display. At the time the first pole was erected, Military Park was referred to simply as 'The Training Place.' At various times, the park has been used for drilling the militia. During the Civil War, thousands of men enlisted at the recruiting tents set up there. Over the years there have been several poles on the park's southern tip. In the 19th century was a steel fabricated pole in the park gave the appearance of coming out of a giant erector kit. This creation complemented the era of the Norman-style Prudential towers that once dominated Broad and Academy streets, and the old central post office on the west side of Broad between Academy Street and Raymond Boulevard. In early times the pole and its decorations were subject of youthful pranks. The decoration under discussion was a wooden cap of liberty which was the symbol of the Republican Party. At the time, the two political parties were the Republicans and the Federalists. Politically the Republicans tended to support France in foreign affairs, and used the cap of liberty as their symbol. The Federalists were associated with Britain, and opted to remain free of European entanglements. The prank consisted of stealing the cap of liberty from the pole and the courthouse, but just as quickly as they disappeared they were replaced. While formed in 1666 as the Township of Newark and incorporated in 1836 as the City of Newark, it was not until the city celebrated its 250th anniversary in 1916 that the necessity to produce a Newark flag occurred. The Committee of 100 that was responsible for that magnificent celebration thought the time was right to give Newark its own banner. An open competition was held in 1915, and the following rules were to apply. The design was to be executed and completely finished in black and white. It was a design which must be adaptable on sheets or cards measuring 9 by 12 inches, to be submitted by September 1915, and the design was to bear no other sign of the author's identity than a distinguishing mark in one corner. Third prize was $20. Second prize was $30, and first prize $50. The emblem was 'to be a simple design for the beholder,' and it was to be compatible on stationery or printer matter. The judges included Joseph M. Riker, Harry Durand and Thomas J. Lintott. First prize was awarded to W. H. Williamson of East Orange from a field of 33 entrants. Newspaperman Harry Wellington Wack, advisor to the Committee of 100, presented the winning submission to the mayor's office. The design submitted by Williamson was in color and had a blue background with white and red stripes on each end of the flag and the seal of the City of Newark in white in the center. While Williamson's design was awarded first-prize, a white instead of blue background was adopted for the flag, which has survived until today. To see the flag, look at the blue, white and gold flags at City Hall, major public buildings in the city, or the gold seal which accompanies official municipal correspondence. Another wartime flag to appear in Newark was the 'V for Victory' which appeared in 1942. According to a Jan. 8, 1942 article in the Newark Evening News, the first 'V for Victory' flag was hoisted in Newark atop the Art Metal Works in Aronson Square, a downtown industrial intersection near the present New Jersey Performing Arts Center and St. John's Church. It was a 6 by 10 foot square flag which flew 100 feet above street level. It was up for the duration of the war. Company president Alexander Harris said, 'When it frays out we'll hoist a new flag. I hope this is only the start of having a victory flag on every factory in Newark.' The idea for the flag originated with Thomas Zollo of 533 Roseville Ave. It incorporated the letter V, the Morse symbol for victory, and the first four notes in Beethoven's Ninth Symphony. The symbol was placed on a blue background. The upper and lower borders were red. Other signs of service personnel were the individual banners in the windows at family homes throughout the city indicating a family member, a son, daughter, father or mother serving in the military. In many instances, more than one star in the window indicated multiple members of the family in the nation's military service. These individual banners were proudly displayed in thousands of front windows during the war. On July 30, 1953, the 70-foot pole at the north end of Washington Park, which had been dedicated in 1917, was reported dangerously leaning by an excited passerby. With hours, the rotted pole of 19 inches diameter, one of the largest in the city, was pulled down to avoid an accident. Hook and Ladder Company No. 2, commanded by Captain Edward Carr, went to the rescue of the pole, reported to be listing at 15 degrees. Because it blocked one lane of traffic, firemen attached lines to the top of the pole from a serial ladder and toppled it into the street without incident. The Shade Tree Commission sawed it up for lumber and removed it. So ended the career of one of Newark's tallest flagpoles. Originally it had been 96 1/2 feet. Some 26 feet had been truncated because of an earlier danger at the top of the pole. Replacing it in 1955, Mayor Leo Carlin dedicated the new United Nations Square flagpole honoring the 10th anniversary of the United Nations. This pole once flew both the American and United Nations flags. The mayor had been the honorary chair of the UN Day committee. At the dedication of the new pole, an elaborate program was held at the old Mosque Theatre. The program was marked by the performance of the New Jersey Symphony Orchestra. A trip around Newark today reveals a bumper crop of patriotic banners and flags downtown. The towering flagpoles at the south end of Military Park and the northern tip of Lincoln Park seem almost to salute each other at opposite ends of Broad Street. A great flag flies from the newly refurbished 10 Park Place Building. At the stately Military Park Building, its flag gives the impression of a great banner atop the castle-like structure. The front of the Robert Treat Hotel bristles with both American and Newark flags, and the splendidly large Prudential Company head office building is almost illuminated by the color radiated by the large banner atop its white marble facade. Additionally, the golden dome of Newark's Renaissance-style City Hall not only sports fresh bright American flags along with another on the top of the building, but a frontyard 'Flagpole of the Week,' saluting a special country or group of individuals. American flags of all sizes and shapes decorate and honor most all public and private structures in between these landmarks. More than 800 brightly colored city-sponsored banners are placed on poles along Broad and Market streets several times a year, marking a particular anniversary or important local event. Last week a star was reborn atop Newark's tallest office structure, heralding the rebirth of the National Newark Building, another vibrant symbol of a recovering city. What a wonderful sight it is! Built during and completed after the Great Depression, the National Newark and Essex Bank Company, later the 744 Building and now the new National Newark Building, has restored the flagpole making it the tallest building and one of the brightest symbols in the city's renaissance movement. The building is 36 stories tall and its Mansard-type roof adds another four stories which supports a flagpole of another 120 feet. The latter also doubles as the broadcast antenna for Newark's radio station WBGO. In late October the steel pole which passes 10 feet through the floor below was refinished, and a new 12 by 18 foot flag was raised from it for the first time in almost a half century. Near-hurricane winds ripped the flag from its mooring, so in early November a larger and stronger replacement was raised to the top of the pole, measuring 20 by 30 feet. Today the city's largest and certainly most visible American flag flies from below the pole's golden knob almost 50 stories above the street below.